We run bookfairs for a growing number of local schools around town, the majority of which take place onsite at the schools. However, like many bookstores around the country, we offer an in-store bookfair program as well. 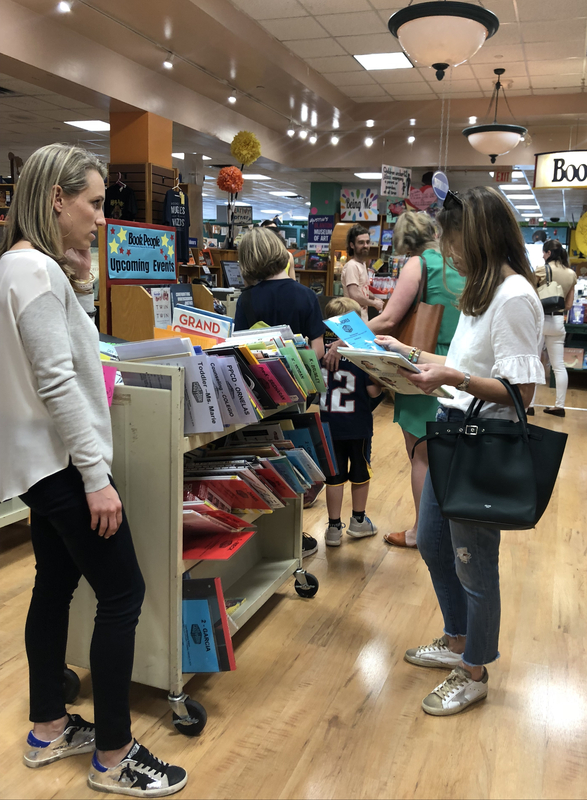 Like any bookfair, the success of instore bookfairs varies wildly and really depends on the community engagement each school is able to generate to support their fundraiser. This week we hosted the annual instore bookfair for Casis Elementary, a school that always hits it out of the park. Their Family Night event at the store attracts hundreds and hundreds of people every year (our clicker count for the store logged over 800 people during their event on Tuesday) and creates an amazing energy that truly makes our store feel like theirs for a few magical, slightly chaotic hours. The key to any instore bookstore lies in creating a concrete reason for people to come into the store. Just advertising the dates only gets you so far. We have several schools that direct students to come in at the beginning of the school year to pick up the semester’s required reading, and that creates the driving force of their annual bookfairs. That model works very well for middle school and high school populations. But the most successful elementary fairs feature a fun family event at the store after school during bookfair week. Lots of schools do this during in-school fairs to bring their community together around books, and the best instore versions do that too. The thing about really successful Family Night events is that they can get overwhelming pretty fast unless you head into them with a good strategy for communication and crowd control. Since this is the largest bookfair we host instore all year, and since we’ve been doing it for about a decade now, I thought I’d highlight some of the strategies that we and they have developed over the years to help it run smoothly! A schedule of events helps families focus their time. It’s not good if everyone in the school shows up at once (a mistake we made the first year), so creating different events at different times helps stagger the crowd. Storytimes with school leaders like principals and teachers are always popular, but it’s also highly effective to add special student-focused programming as well. We’ve seen poetry readings, performances, and open mic nights. 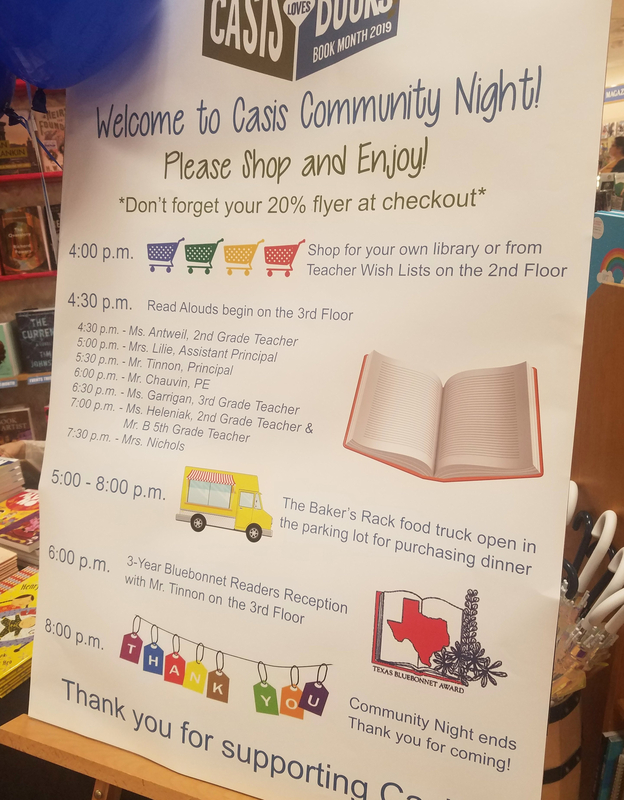 Over the past few years, Casis has been hosting a special reception for all the kids who completed the Bluebonnet State Reading list, which is a wonderful addition to the schedule. But communicating that schedule is equally important. In the early years of this fair, we often struggled to make announcements over the loud crowd. So a beautifully printed schedule at the front of the store, like the one pictured above, positioned alongside volunteers to greet families and talk them through the event really helps! In fact, working with the school to station volunteers in key locations through the store is vital. Kids get very amped up at events like these, and controlling the wild running, jumping, and merchandise throwing can be a big job—and one that we need the hosting school to help wrangle. Any evening event with so many families needs to offer some food options. 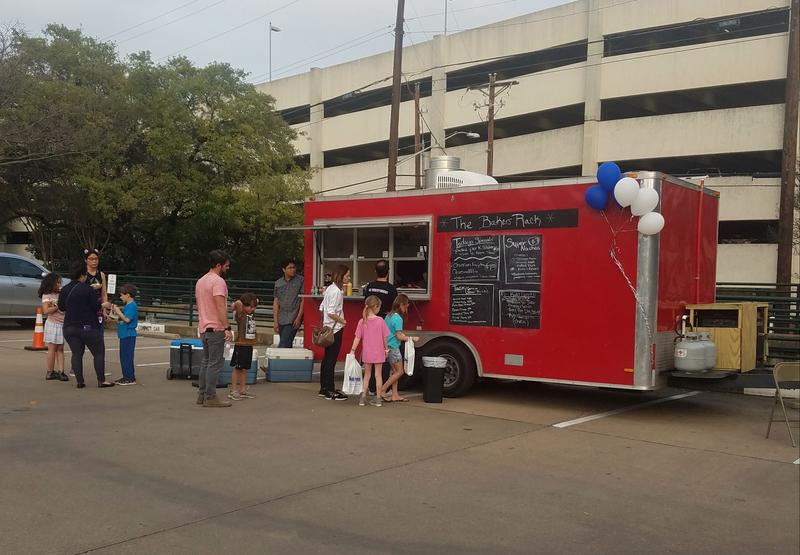 This school typically contracts with a local food truck to come in, which works nicely. Sometimes they have some snacks inside as well, but this year just having the food truck outside really simplified the whole process. Featuring class wish lists on one cart sorted by teacher makes it easy for families to support their kids’ classrooms. Plus we sent Shannon Brewer, our resident school booktalker, to the school in advance to talk up some key titles. Then she came to the event and stood by her book display as a friendly face to remind kids what the books were and to help them find new ones. One final tip? Go ahead and order pizza for the staff. These events are a lot of fun, but they require everyone on staff to stay high energy all night. Tell me fellow booksellers, what else have you seen that works well? This entry was posted in Uncategorized on February 8, 2019 by Meghan Dietsche Goel.